DIRECTV for Hotels is one of the top rated hospitality tv solutions in the country, and it just keeps getting better. We’re going to take a look at all of the reasons why hotel properties should switch to DIRECTV for Hospitality, and teach you a bit on how it saves hotel owners money. Not only does Sonu Satellite already serve major hotel chains tv solutions nationwide, it also continues to lower the bottom line whenever possible all year long. We have made a very respectable name for ourselves within the hospitality industry, and remain dedicated to the standards of quality and service that have advanced us in business for over 20 years. Considering that you are most likely reading this article as the owner of either one or multiple hotel properties, we will begin with the hotel tv bottom line. DIRECTV for Hotels offers more channels on the dollar than cable for business providers. On top of that, DIRECTV also regularly offers hospitality owners promotional pricing to upgrade from cable. Sonu Satellite is a nationally authorized re-seller of DIRECTV for Hospitality, and our best pricing is known throughout the hotel tv industry. Our company is an approved vendor and supplier with Best Western, IHG, Red Lion Hotels, Choice Hotels, Carlson Rezidor, and many more! Not only do we keep them up to date on the best hotel tv solutions, but we handle providing them service across the country as well. Sonu Satellite is often one of the first authorized re-sellers to be informed on new DIRECTV for Hotels Programming Promotions, Technology Releases, and Subsidies. DIRECTV for Hospitality has programming packages for every hotel tv style, from major hotel chains to bed & breakfast locations. The lowest priced base package offers over 50 channels with more than 20 in HD quality. These channels include Disney, Nickelodeon, The Food Network, C-Span, HSN, Hallmark and more. Certainly not just off-brand programming. Just one step above that channel package, and your hotel now offers guests over 100 popular TV channels with over half of them broadcasting in HD. Make your guests feel at home with the same TV channels they would be watching on their own couches. DIRECTV Cinema is included with the DIRECTV Residential Experience Plus system, and offers Hotel guests all of the newly released movies they want to watch On Demand. Many of the movies provided are even released before Netflix and Redbox. DIRECTV Cinema uses a digital media caching system, which allows guests to stream their favorite movies without overworking your Hotel’s broadband network! No buffering and instant access to the latest public releases of box office hits. Anti-Microbial Remotes are a major selling point for the Hospitality Industry today. All DIRECTV Hospitality Remotes are coated in an Anti-Microbial finish, allowing them to be sanitized better and pass less germs between guests and staff. Anti-Microbial Remotes are proven to be far more sanitary than traditional tv remotes on the market. 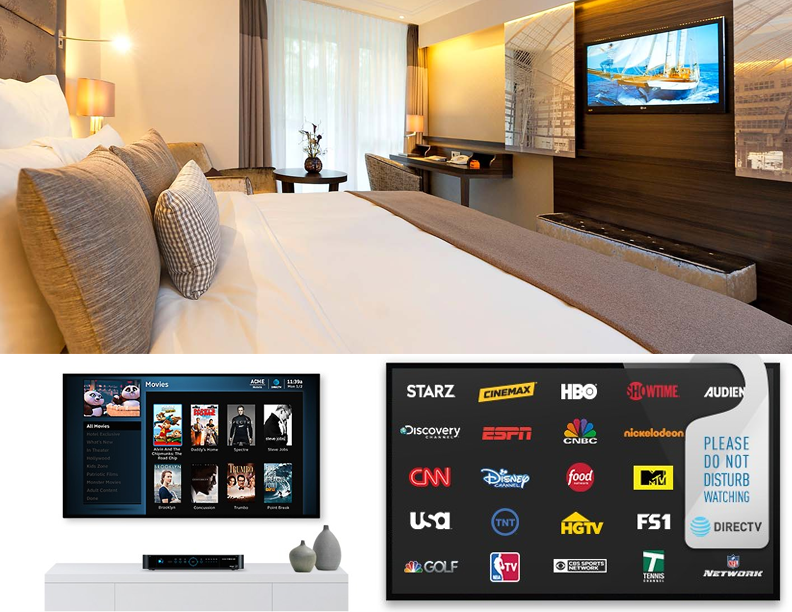 With the option of installing either a Headend System or a DIRECTV Residential Experience System, your hotel can upgrade to DIRECTV with Pro:Idiom Hotel TVs or Non-Pro:Idiom Hospitality Televisions. If you are interested in making a complete upgrade to your hospitality entertainment systems, Sonu Satellite also has best pricing on the latest TVs for Hospitality from both LG and Samsung. Take every room and lobby in your hotel to the next level by installing the DIRECTV Residential Experience and OLED Flat Panel Televisions. Take advantage of all the latest user interface technology, and co-brand your guest’s entire media experience! My wife and i travel a great deal and would like to have hallmarks tv channel. Hello there! Are you inquiring about DIRECTV for your online devices, or possibly for your RV? I think it might be best for you to call our offices at 877-999-7668 with a bit more information. We would like to provide you with a solution if possible.